Welcome to #Shmuptember, everyone! Wait, do you mean to tell me you don't know what #Shmuptember is? In that case, here's a little explanation: #Shmuptember is the most recent of blogger Anne Lee's "community game-along" events that tasks willing participants with playing any and all shoot 'em ups that strike their fancy and then sharing their experiences with others--be it in blog posts, podcasts, Tweets or via some other form of social media. Given the love I've long felt for this genre, I'd be remiss if I didn't put a slew of shmups through their paces this month. In fact, I've already spent a good amount of time with six of them. Continue reading for a few thoughts. AeroStar (GameBoy)--An intriguingly odd example of the genre due to the fact that it combines traditional overhead-shmup trappings (flying a plane, shooting anything that finds its way on screen) with the most noteworthy elements of Data East's arcade classic, Bump 'n' Jump. Specifically, the majority of the average Joe's or Jane's experience with AeroStar is spent scuttling along roads of various widths while oncoming enemies attack from all angles. Every so often, though, the road falls away and they're forced to launch into the air--but only for a limited amount of time. The game's definitely held back a bit by the GameBoy hardware--a fact that's most plainly observed in the stuttering quality of its scrolling fields--but never to the point that it becomes unplayable or even unenjoyable. 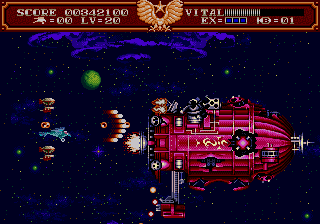 Darius Plus (PC Engine)--I've always thought of this game as being an example of "Deep Blue done right." 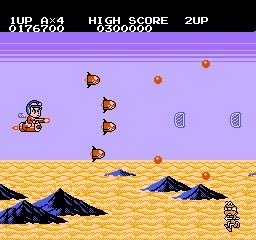 After all, both games feature a bevy of aquatic settings and foes, although Deep Blue does a lot more with both of those aspects than its Taito-made counterpart. Still, Darius Plus has always had better word of mouth attached to it than Pack-in Video's oft-vilified effort. My rather limited impressions of Darius Plus so far support the notion that it's a better shmup than Deep Blue, but only just, as neither one appeals to me all that much at the moment, I have to say. Here's hoping that changes, and for the better, before #Shmuptember comes to a close. 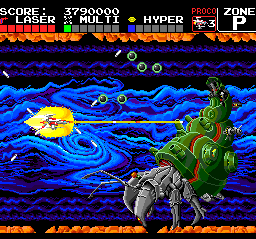 Insector X (Famicom)--As much as I love (or at least want to love) the aquatic-themed shoot 'em ups discussed in the bullet point above, both of them currently pale in comparison to this insect-themed example of the genre. Although this version of Taito's Insector X isn't quite "arcade perfect," it ably holds its own when it comes to every aspect that matters. I especially like that players are able to choose boy or girl pilots--and that said pilots make adorable little faces while shooting at the similarly cute arthropods that zip and zoom around the screen. This horizontal shmup's bosses are worth noting, too, both for their appealingly cartoonish designs as well as for their screen-filling girth. 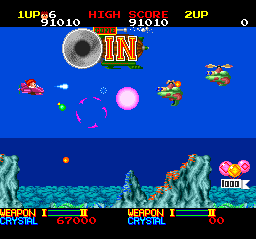 Ordyne (PC Engine)--Is this Namco-made game a cute 'em up (à la Parodius and TwinBee) or more a straight-laced shmup like the other games mentioned in this post? It's often hard to tell while playing it, which is a real shame. Personally, I wish its designers had decided to lean more heavily toward adorable than traditional, as examples of the latter are a dime a dozen, especially on the PC Engine. Even in its current state, though, I've got to say I quite like Ordyne. It's colorful, it's got funny-looking enemies (always a plus in my book) and it's acceptably enjoyable. Sure, it could be more engaging or exciting--like its Konami-made counterparts, for example--but it's hard to whine about that when the rest of it is able to bring a smile to your face. Steel Empire (Mega Drive)--I remember reading about and seeing screenshots of this HOT*B-made title way back when it was released, but that's about it. I wasn't much of a smhup fan at the time--well, aside from cute 'em ups like Pop'n TwinBee and the like--so I never even downloaded and played a ROM of it until recently, when it popped back onto everyone's radar due to the just-released 3DS remake. As great as this new version may be (and I've only heard good things about it), the 16-bit original's pretty great, too, thanks to its original ideas (one of the selectable ships is a dirigible), steampunk-inspired visuals, tight controls and challenging gameplay. Tenjin Kaisen (GameBoy)--If ever you've wanted to play a shmup that embodies the look, theme and feel of Koei's Samurai Warriors (Sengoku Musou) series, well, here you go. Actually, you may want to try this one, called Mercenary Force in North America, even if you've never dreamed of such a thing, as it should prove interesting to both musou fans and noobs alike. The main reasons for that: players begin by hiring four "mercenaries" that represent five different occupations (for lack of a better word) and offer varying amounts of health and weaponry. After that, it's off to battle, with the aforementioned quartet basically acting like "options" in your typical shoot 'em up. (They even can be rotated into various positions, depending on the situation at hand.) Some are sure to look at the graphics on display here and groan a bit, but they're far from bad and, if my experience is any indication, they're likely to improve over time. So, that's some of what I've been playing--and will be playing--throughout #Shmuptember. Which shmups are you planning to tackle? That's awesome, Simon! Also, look for a "recommendations" post on Monday--although I have a feeling you'll have played some of the games I discuss in that one :) Oh, and let me know what you think of these games, should you play any of them! If you want to play a Darius game, Darius Plus is probably not the right place to start. I'd suggest playing Sagaia (Darius II) on the Genesis, or stepping up to Darius Gaiden (Saturn, although I think it's on Taito Legends 2 also) or G Darius on the Playstation (also on Taito Legends 2. But I wanted to play a PC Engine game, Jess :( Plus, this way, later Darius games should look pretty darn good once I get to them, right? As for the Terra Cresta games: which one(s) are you going to play? I've only ever heard of the NES one myself, and I avoided it as a kid because the box art turned me off for whatever reason. As for Terra Cresta, I'm gonna cover as many games in the series as I can, along with a few related titles. You'd be surprised by how prolific it was! There were at least a half dozen arcade games that were either related to Terra Cresta or inspired by it. The concept of a shooter with Voltron/Power Rangers elements had legs, I'll tell you that! BTW, the NES version was all right. Not as good as the arcade game, but a solid port considering the hardware. It let you choose the direction each of your auxiliary ships could fire, giving you some degree of customization. Will you be writing about your Terra Cresta adventures on your blog, Jess? If so, I look forward to that particular write-up, as now you've got me interested in this series! Great list! I was thinking about playing Ordyne too, as it's available on the Wii Virtual Console, and I really love the look of it! Steel Empire is so much fun too, after playing (and loving!) the 3DS version, I'd love to have a go on the Mega Drive one! Hey there, Morgan! I completely forgot that Ordyne's on the Wii shop. Anyway, yes, that would be a great way to pick it up. I wonder if Steel Empire's on there, too? Probably not. Glad to hear you, too, liked the 3DS version, BTW! I'm gonna try my best to make it to the arcade in town this month to participate in #Shmuptember. They've got 1942 (or 1943?) and a few others. Who buys me a PC Engine?